We are prime Manufacturer, Exporter & Supplier of Operation Table (OPTB 500) from India. We can make available our advanced range of Operation Table in various countries. We use the finest quality material to manufacture the Operation Table assuring durability. We ensure timely and safe delivery of our equipment. 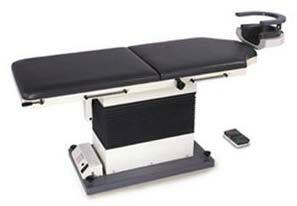 The Plantech Motorized operation table manufactured and developed, exclusively for the ophthalmic surgery and it is very stable and versatile. Its ergonomic design ensures both surgeon and patient comfort. The Plantech OPTB-500 has a maximum height of 890 mm and minimum height of 610 mm ideal for standing or sitting working position. Choice of head sections gives easy access to the patient, whilst allowing maximum legroom and space for equipment pedals. The adjustable cushioned headrest ensures patient comfort and restraint during operations. Patient comfort is assured with deep antistatic poly-urethane cushions which are easy to clean and are wide enough to allow patients to lie with their arms by their sides without the need for additional armbands. The adjustable wrist support provides comfort and stability while operating. Trendelenberg (head low position) and reverse trendelenberg facility ensures safety during emergencies.